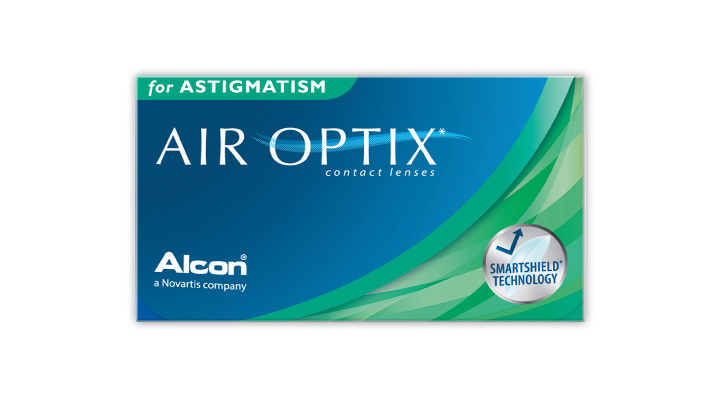 Note: Air Optic for Astigmatism has been discontinued by Alcon as of Feb 2019. We hold some stock of this lens and if your powers show in the drop down list, then it is available to order. Air Optix for Astigmatism combines a new level of comfort with enhanced Oxygen transmissibility which provides superior all day wearability in a lens that is healthy for your eyes. Advanced lens optics results in a thin contact lens edge at the points where you need this moist, where the lens interacts with your lids, which results in excellent comfort. Lenses for astigmatism are noted for their inconsistent vision, especially after blinking, while the lens reorientates on your eyes. To overcome this - Air Optix for Astigmatism has a wide optic zone built into the lens so that you can see clearly, even after blinking. Before I had lenses that always moved slightly on the eyes, but that`s not the case with toric lenses from Air Optix. They appear a bit thicker than other lenses but are quite comfortable to wear. Will buy them again.